In July of 2008, I wrote about a fun little gun I had picked up, an H&R Pardner Compact shotgun in .410 bore. The name of the story was “Hiking Stick” because my purpose for it was as a “have-along” for the efficient dispatch of pit vipers while hiking. The main thrust of the story was how close it came to being subject to NFA ‘34 restrictions once I replaced the buttstock with a Choate polymer pistol grip. 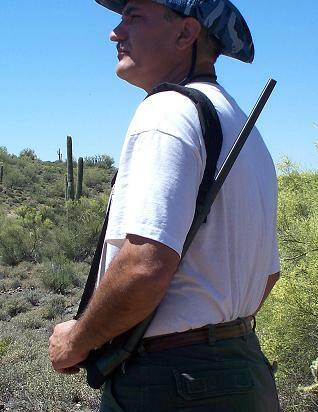 Even if a shotgun’s barrel is comfortably over the 18” minimum length as is the Pardner’s at 22”, a shotgun may still be too short in overall length if equipped with a pistol grip. 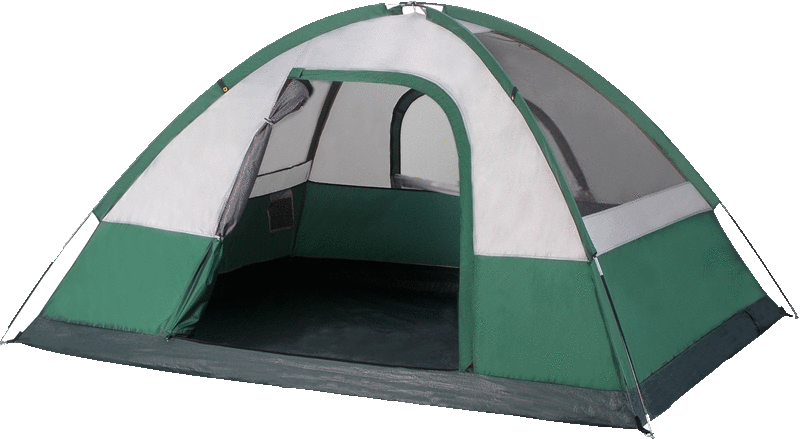 The legal overall length limitation is 26 inches. The Pardner Compact equipped with a pistol grip comes in at 27 inches. On the warm wind-free sunny Sunday afternoon of March 8, 2009, my wife Anne, our dog Mele and I went for a stroll through the forest behind our house on Appalachian Road in Flagstaff. We headed east, more or less contouring along the base of Elden Mountain. I brought my digital camera to photograph a huge ancient alligator juniper that we knew of along the trail. A mile-plus later, there we were at the purportedly several-centuries-old tree. I got into position for the perfect shot. We decided to push on an extra half mile to revisit the site of the mid-1880s homestead of the Elden family. The place includes a clearing where the family cabin once stood, and a nearby spring that was the source of their water. Anne and I had visited this place before. But I'd never seen the spring flowing, and thought with our recent snow melt that today might be able to prove that Elden Spring was aptly named. Anne and Mele stayed to explore the cabin site while I hiked the 20 yards or so, out of sight, down into the forested stream bed. Surprise! Water was emerging from fissures between huge pieces of the dacite lava and gathering into a small inviting flow. Someone (the Elden family?) had built a channel that directed the flow into a small holding tank. As I soaked in this refreshing scene, a red fox suddenly appeared, about twenty feet away, on the far side of the streambed. He came running directly toward me at top speed, squealing and yipping the sounds of a small unhappy dog. I was under attack. I had no time to create a workable plan for evasive action. My sole thought was this critter must be rabid because healthy foxes run away from humans, not at them. Before I could take even one step of flight, he sank his teeth into the toe of my right sneaker (but not into flesh. At least I felt no pain). As I lifted and shook my leg, he fell free. I noticed that his sharp teeth left a row of parallel rips across the flimsy cloth of my sneaker's toe. Energized by an adrenalin rush, I managed to land a kick powerful enough to put him back on the other side of the streambed. But with that kick I lost my balance and fell backward into a small tree, snapping off dead branches as I fell. By the time I was back on my feet, my furry attacker was bee-lining for me again. At the last second, I turned sideways and managed to score another strong kick before he could sink his teeth into me. This time he landed on my side of the streambed, unconscious and bleeding from his mouth. I scrambled away, shouting "Don't come down here! Don't come down here!" I gathered Anne and Mele yelling "Let's get out of here." We jogged a few yards down the path, and stopped briefly for me to catch my breath. I gave Anne a short version of what had happened at the spring. As I explained, she and I (foolishly, in hindsight) explored my torn sneaker, exposing our hands to fox saliva. We then walked briskly (understatement!) back home, warning other hikers away from Elden Spring. I called Flagstaff's Animal Control Department and learned that a cell-phone-carrying person we had warned along the trail had already contacted them. An officer came to pick me up so I could lead him and his colleague back to the site of my attack. They were armed with 10-foot hollow poles threaded with cable outfitted with a loop that could be tightened around the neck of an out-of-control critter, from the relative safety of the pole's length. I led them to the spring, lagging a bit behind while giving voice and hand directions. Damned if the fox wasn't still there, conscious again and about 100 feet downstream from where he had attacked me. He charged as soon as he saw us, and my Animal Control companions proved that they know how to use the tool of their trade. It's now March 16, eight days later. The lab results just back from Phoenix confirm what smart money would have bet on all along. Rabid!! During those eight days of waiting, Anne and I were oblivious to the fact that by simply handling my ripped sneaker, we were exposed to the rabies virus via fox saliva. Once that was explained to us, we began the series of anti-rabies shots. As I update this story today (March 30, 2009), the fourth shot will be administered in one hour. Shot five, the last of the series, will be in two more weeks. Thankfully, the shots are not the old infamously painful ones in the stomach, but rather today they are like the pin prick of a flu shot in the shoulder. At nearly $200 a shot, any significant pain will be to the pocketbook. But the alternative, once the rabies virus has infected a human body, is almost sure death. In my last story on this gun, I said that I thought that slinging the Pardner was probably not the best way to carry it. I’ve changed my mind. I added a barrel-band sling-swivel up front and a $6 nylon sling. It does indeed carry quite comfortably that way. 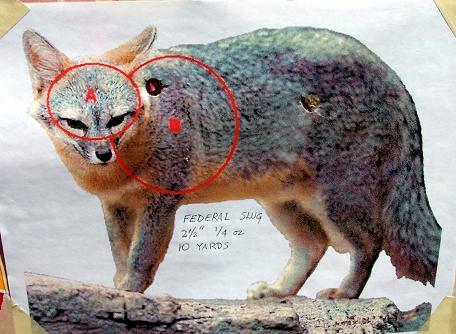 Well, certainly a load of birdshot in the face should give serious pause to an attacking fox or other small, rabid furry creature such as a skunk or a racoon, but what about stronger options for the .410, such as slugs and buckshot? Besides for self-defense, how about slugs and buckshot for general small-game hunting purposes with the .410? The only testing I had done with the Pardner so far was to blow away some empty pop cans at short range, and to hit a few hand-thrown clays in the air. I decided to gather up a few different loads including birdshot, slugs, and buckshot to see how they look on paper. First I wanted to see what the birdshot patterns looked like. 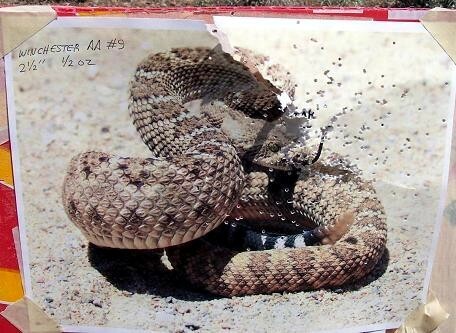 But just shooting at a blank sheet is no fun, so I did a quick internet search for a good picture of a rattler for my target. 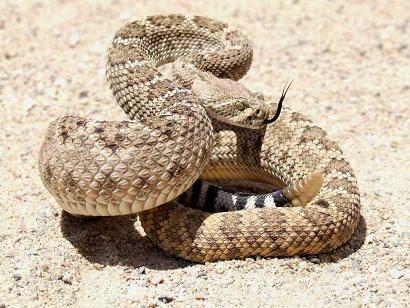 Sorry to disappoint, but I didn’t take the first photo in this story of the coiled rattler in person! I also still had some small furry game targets left over from a .22 shoot we held up in the pines a few years back. My first test load was the 2½” Winchester AA target load. This load holds ½ ounce (219 grains) of #9 birdshot. I figured that 5 yards would be about the maximum distance that you might stand away from a rattler before pulling the trigger. I mentioned that I removed the sighting bead from the top of the barrel to prevent snagging brush while carrying. I sighted straight along the top of the barrel, covering the target with the end of the barrel. I found out that this particular shotgun throws its charge a little high and right, sighted thus. Still, enough of the swarm struck head and body to have done the job. The next load tried was another birdshot load, the 3 inch Federal with 11/16 ounce (301 grains) of #7½ shot. This is a heavier payload of bigger shot. This time I aimed low and to the left to compensate for the high-right impact point I had seen with the Winchester load. My target backer is a piece of red corrugated plastic. It was interesting how this load opened up the paper target in the fat part of the snake’s body, which made it look like raw red meat was exposed! OK, so besides the fact that the center of the swarm hits a little high and right, the effect of the birdshot pattern on a diamondback target was pretty much as expected. What could we expect from the slugs? As it happened, one of my furry creature targets was a fox. Printed on 8½” x 11” paper, I would say that the fox was about 2/3-scale. I stepped back to 10 yards and fired two slug rounds at it. I had only one slug load with me, the Federal ¼ ounce (109 grain) Foster-type rifled slug. I was impressed when the first shot printed right inside the kill zone of the target. Remember that I have no sights on this gun, I’m just sighting along the top of the barrel. The second shot was also a stopper if not a killer, striking just forward of the on-side hip where it would have continued traveling into the center of the off-side hip. For this gun, I see slugs as having greater utility for small game hunting purposes, rather than for defense against rabid critters. 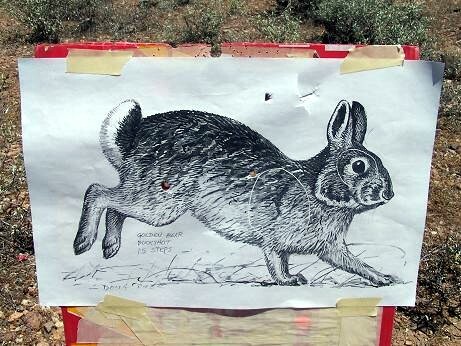 Maybe best suited for pot shots of opportunity at cottontails or jackrabbits. For self defense against rabid critters, I think buckshot is the better choice. However, the .410 with buckshot has its drawbacks. First of all, in such a small shotshell, you will have a small number of pellets. The whole reason for using shot rather than a slug, is to increase your hit probability. However the other drawback is that to have more pellets, the pellets will have to be smaller, limiting the delivered energy of each individual buckshot. I have found only 3 or 4 commercial loads of buckshot for the .410. Two are made by Winchester (sort of). Winchester catalogs a 2½” load of 3 triple-ought buck balls, plus a 3” load of 5 triple-ought (000) buck balls. Trouble is, that the 5-ball load seems to be produced only very sporadically. No one has this load on their shelves right now. The 2½” load has proven to be popular with owners of Bond Arms .410 derringers and with owners of the Taurus Judge .410 revolver. Triple-ought buck has a diameter of .360” and each ball weighs about 70 grains. Speaking of the Taurus Judge, Federal has just introduced a 4 pellet 000-buck load marketed specifically for the Judge. In fact, Federal calls it Premium Personal Defense Handgun ammo. Right on the box, it says “.410 Handgun”. It’s a 2½” load, as that’s all the original Judge can handle. There’s a new longer Judge that was just introduced that can now handle 3” shells. The one other load out there is a Russian load marketed as “Golden Bear” in this country. This is the buckshot load that I had on hand for testing. It is sold as a 2¾” length cartridge, but in reality it’s a lot closer to a full 3 inches. This load uses 5 pellets of #4 buck. The diameter of #4 buckshot is .240” or 6mm, and each pellet weighs only around 21 grains. That’s less weight than the bullet from a standard .22 LR rimfire cartridge. The other interesting thing about this load is that the cartridge body is 100% brass-plated steel. It is Berdan primed, as you would expect of Russian ammunition. It was originally intended for the Saiga AK-47 based semi-automatic .410 shotgun. Instead of changing targets, I fired my first shot of the Golden Bear buckshot at the slug target. You’ll have to mentally subtract the two slug holes from the photo above. 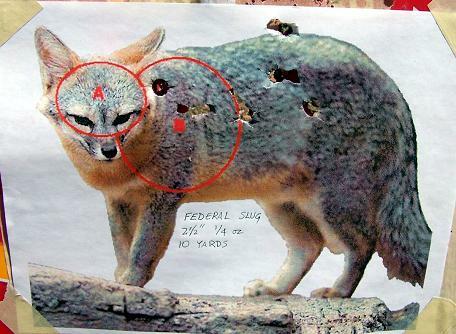 As you can see, the buckshot pellets fairly well-centered the critter. I fired from the same 10 yard distance. This distance might be typical of the rabid critter self defense scenario. But be careful with skunks; they can shoot back, but only to a distance of 8 to 15 feet. The mist can carry on the wind farther than that, so vamoose after taking a shot! Next, I considered the small-game hunting scenario for .410 buckshot. This would probably be at longer distances. I set up a jackrabbit target and stepped back to 20 yards distance. Actually, I took one shot, set up a new jackrabbit target, then took a second shot at 20 yards. In both cases, only one pellet out of the five struck the jack’s body. One of the hits was a vital zone hit, so that was good, but the other was a little further back. It might have been a spine hit – maybe. So at only 20 yards we start to see the limitations of .410 buckshot. Even if both shots hit vital areas, one has to wonder how much energy the 21 grain pellets are still carrying at the 20 yard distance. With this limitation in mind, I tried one more time, this time at 15 yards. 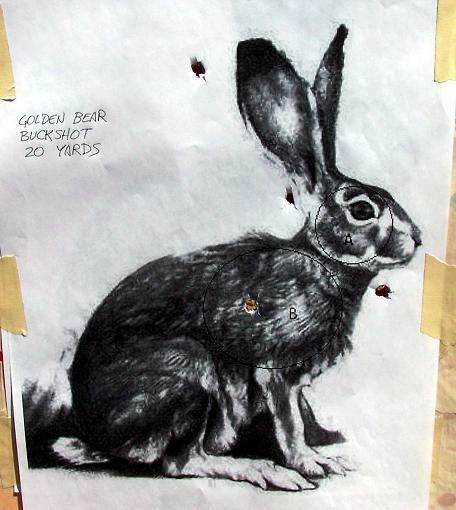 I set up a cottontail target and fired the Golden Bear buck at it. This resulted in two body hits, neither optimal. 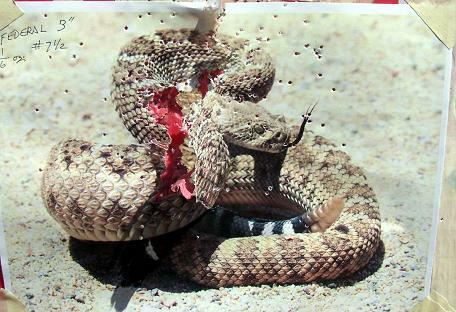 Alright, my results seem pretty clear cut: For snakes – birdshot. The 3-inch load of #7½ shot does seem to have advantage over the 2½” load of #9s. For close range self-defense against rabid critters, it’s buckshot. I need to obtain that new Federal buckshot load and test that though. Only one fewer pellet than the Golden Bear, but the bigger pellets strike harder. For taking small mammals of opportunity, the slug is the best choice. In this scenario, you’ll have time to take more careful aim to make the single projectile count. But really, a .38 or .357 on your hip is a better choice for that.